I’ve never been that “outdoorsy” kind of guy. Going for a walk for no reason? That’s not me. Go on a Camping Trip? Sure, if its reachable by car. But only if the weather is good enough. Which means: not too warm or cold, no rain or snow, no bugs’n’critters. You know. My home is my castle and i like to be there. Hell, it feels like that this was “me” in a totally different life. A life that has ended so long ago. A life I’m very grateful for. And a life i don’t want back. From my perspective its exactly that. An episode of my life where i’d rather stay at home or close to it than going out to explore the world around me. A lot has changed since my second (or third?) birthday. I’ve changed and so did my life. Nowadays I’m planing my next adventure coming up in 2018. March 1st, to be a little more specific. That will be the day when i will leave Germany one more time to go on another big trip. Actually it’s not just one but two. The first one will be the PCT (the Pacific Crest Trail, located on the West Coast of the US) where i plan on hiking the whole thing. From end to end going North. The PCT is a Long Distance Hiking Trail with a length of about 2660 miles ( ~ 4280km ) and which passes through 25 national forests and 7 national parks. Since I’m going NOBO (Northbound, going South to North ) i will start in Campo, California right next to the Mexican Border. I will hike through California, Oregon and Washington on my way to Manning Park, Canada where the Northern Terminus is located. From what I’ve experienced and learned while hiking the Appalachian Trail, i now plan on taking my time, doing side trails if possible and get the most out of that journey. Therefore i will hit the trail March 15th and keep on going for approximately 6 months – being done with it on September 15th at its latest. I do know that i can’t exactly plan on finishing on that specific date and i will surely need to adjust my pace on trail, taking more or less Zero/Nero/(Beero) Days (i will explain that later on 😉 so that i can enjoy this trail, nature and people as much as possible. Another lesson i learned on the AT is, that 6 Months is just not enough time out there. I know, some people will call me crazy. Well. That’s fine by me. Nevertheless i will go a little further and tackle another trail after that. I’m not interested in the so-called “Tripple Crown” that’s why i won’t hit the CDT afterwards (which wouldn’t be a good idea anyway, except doing it SOBO). I will return to my first “Love”, where i got infected by the travel bug, where i found my adventurous “me” – New Zealand. 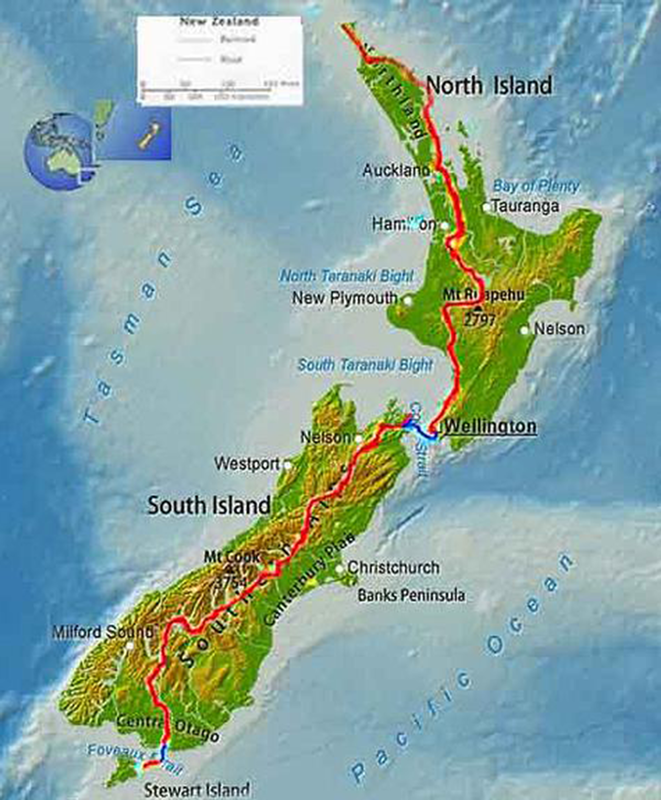 The TA (the Te Araroa Trail, crossing throughout both Islands) is a great chance for me coming back to Aotearoa (NZ) and to spend some additional quality time over there. I’m waiting for that chance for quite a while now so I’m really happy about that opportunity! The Te Araroa is a pretty young Trail in terms of its opening date (03/12/11) – the last (and first) time I’ve been there was in April 2013 and i didn’t know anything about it back then. As already stated, i always wanted to go back to the most beautiful country I’ve seen so far. As soon as i heard about that trail the decision for me was made. I will go and hike that trail. The trail is slightly shorter than the PCT or AT with almost 1900 miles ( ~ 3000km ) but quite different regarding terrain, weather, elevation changes, resupply possibilities and difficulty. Even though i will have hiked that trail ~ 1.5 times distance wise, I’m not planning on rushing through it as well. There are a couple of spots i want to see but those are not really on-trail. If possible, i will try to take some time off to get to those points and explore a little bit more then i did the last time. After that, i will fly over to Australia (New South Wales) and see what adventures i will find there. Maybe a month or two. Depending on how i feel and what my body can handle after those two very long journeys. Now, the most obvious questions you will probably have after reading all that: Why? The real reason for me doing all that is kinda difficult to explain but i will give my best. I want to be alive. I want to be in touch with me, my surroundings, fellow hikers and the most awesome and wonderful people you can only find while being on or close to such iconic trails. I want to learn. I want to explore and i want to live that good ol’ “Hiker-Trash” Lifestyle. I want to drop off all the things i don’t really “need” in my life. Being free to go and do what ever i want to do. Living the minimalist’s life, you know. And if there is someone out there who feels inspired by what I’m doing and that person feels the urge to go on his/her very own adventure (what ever that may be) i couldn’t be more happy about that! See you on a trail, maybe!